If you want to try a new restaurant, do you read reviews before picking one? How about when you go to a new doctor? Chances are, you want the best experience possible, so you’re not going to try a new restaurant before looking at some reviews, and you certainly want the best doctors to help keep you healthy. The same goes with HVAC companies. We have tips for how to choose the best local HVAC company to keep your heating and cooling systems running perfectly, and if you need an HVAC company in Doylestown, Chud Air Conditioning & Heating is here to help you. Just like with restaurants, HVAC companies have reviews, too. You can read reviews from Google or Angie’s List, and you can also check the company’s website for testimonials from customers. If you’re having trouble finding reviews, you can ask a company for references. At Chud Air Conditioning & Heating, we make sure that all of our employees go through certification and training programs, but not all companies may do that. Before you hire a company, read their website or ask them about the certificates and training they have completed. The only way to really assess a situation is in person. If an HVAC company tries to give you an estimate over the phone without seeing the units in person, they can’t see the whole picture and the estimate likely won’t be accurate. 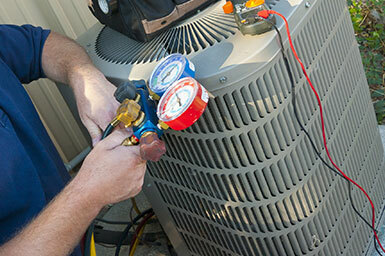 You should always get estimates or contracts in writing, and it applies to HVAC companies, too. Even if the company seems trustworthy, make sure you get the estimate in writing so they can’t go back on their word and try to charge you a different amount. There are many factors to take into consideration when finding an HVAC company, and hopefully our tips on how to choose the best local HVAC company help. If you need an HVAC company in Doylestown, PA, contact Chud Air Conditioning & Heating today to learn more about our services or to schedule a free estimate.